This is NOT the General Replacement For Most Silencer Systems. Works For Silencer 8000 Model Series Only. 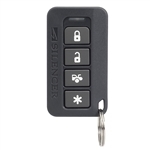 Silencer 4 Button Replacement Remote. Remote Case Color: Black All in one key receptical, LED & Valet holder designed for use with Silencer Models 5900P and 6900P. 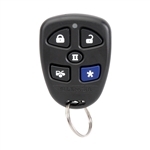 The newest replacement for this remote will program to systems using a 1, 2, or 3 Button Silencer remote. FCC ID # ELV777K or ELVMT5A Get Your Car Started Now! 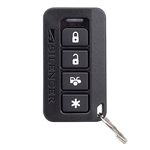 If your remotes and keys to your silencer Security System are lost or not working, this will enable your car to start by bypassing your security system. General Replacement For Most Silencer 4 Button Remotes. For Older Silencer 6000 & 7000 Model Series. Does NOT Work With the NEW 8000 Model Series or Remotes With GREEN LED. 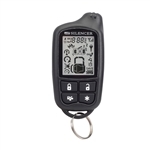 Replacement Silencer remote for FCC ID: ELVMT3A All in one LED & Valet holder designed for use with most Silencer and Carbine Systems, though can be used for most security systems.